Private collection, Germany; (sale, London, Sotheby's, 6 July 1992, no. 169, as French School, 18th Century); (Galerie Cailleux, Paris); purchased by NGA, 1992. Goncourt, Edmond de. Catalogue raisonné de l'oeuvre peint, dessiné et gravé d'Antoine Watteau. Paris, 1875: under number 540. Jean-Richard, Pierrette. Musée du Louvre. Cabinet des Dessins. Collection Edmond de Rothschild. Inventaire général des graveurs. École Français I. L'Oeuvre gravé de François Boucher... Paris, 1978, under no. 94. Grasselli, Margaret Morgan. "Eighteen Drawings by Antoine Watteau: A Chronological Study." Master Drawings 31/2 (1993): 110-111, no.5. Wintermute, Alan. "Le Pèlerinage à Watteau, An Introduction to the Drawings of Watteau and His Circle." In exh. cat. 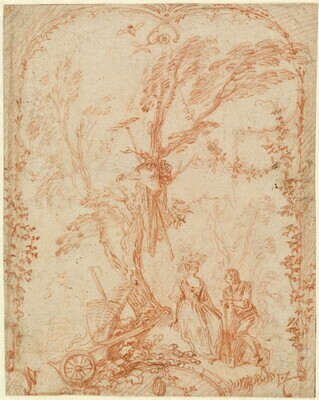 Watteau and His World, French Drawings from 1700 to 1750, New York and Ottawa, 1999-2000, 20-21, fig. 10. Grasselli, Margaret Morgan. Renaissance to Revolution: French Drawings from the National Gallery of Art, 1500-1800. Exh. cat. National Gallery of Art, Washington, 2009: 92, fig. 1.